Donald Trump landed in the UK yesterday for his first visit to the UK and First Lady Melania obviously accompanied him on the trip. 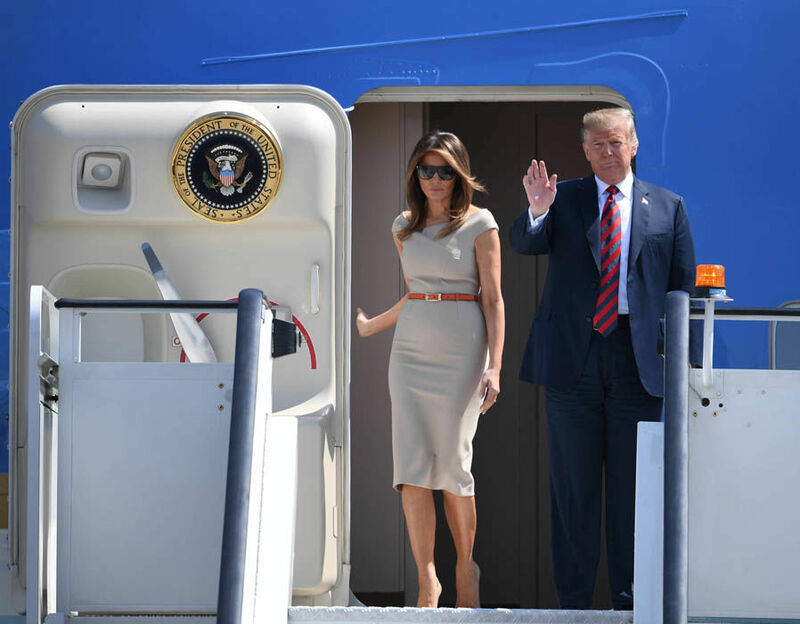 Here alighting off Air force one at Stansted, Melania opts for a structured light grey knee length dress, which can be said that she’s channelling her inner Meghan Markle. Earlier this week on her trip to Ireland, the Duchess of Sussex wears a grey Roland Mouret knee length midi dress, with a boat neck collar just like her wedding dress. Meghan seems to favour the boat neck collar, so will this be her signature look? Only time will tell! 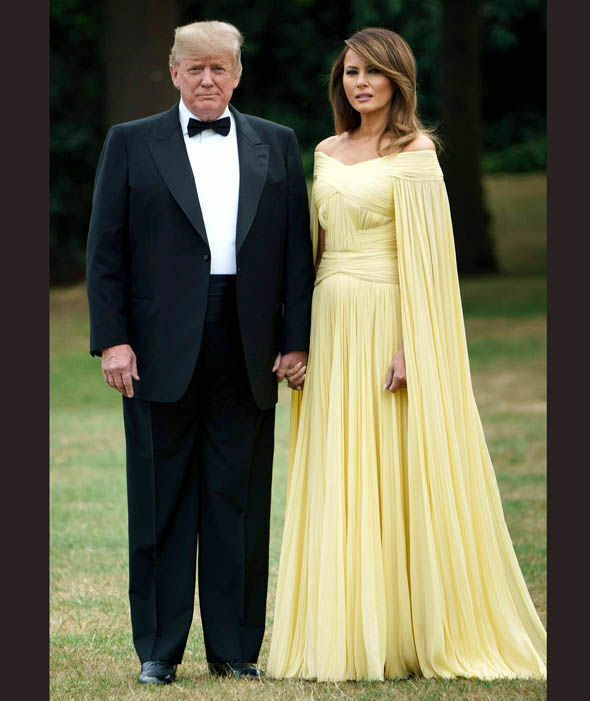 Last night Melania wears buttercup yellow chiffon gown for her dinner with the Theresa May and other senior government officials. This morning for her visit to the Royal Hospital Chelsea, alongside Philip May, she opts for again a knee length dress with vertical stripes by Victoria Beckham to meet the Chelsea Pensioners. The Trumps are set to meet the Queen at Windsor this afternoon. Posted July 13th, 2018 in Event Reports. Tagged: First Lady, First Lady Fashion, meghan markle dresses, Meghan Markle fashion, meghan markle outfits, Meghan Markle Roland Mouret dress, Melania Trump, melania trump dresses, Melania Trump fashion, melania trump outfits, the duchess of sussex, the duchess of sussex dresses, the duchess of sussex fashion, Trump's visit to the Uk, What dresses is Melania Trump wearing on her first visit to the UK as First Lady?.